After the conference was officially over, I had free time to explore Melbourne. Before I left Sydney, I spent some time searching online for various places and attractions worth seeing in Melbourne. Since I had a lot already planned even within the hotel room, I didn’t feel like going to anything that was too expensive. After all, the objective was to keep expenditure limited. However, searching online normally only gives you the same old highly popular tourist attractions. As a result, you can end up missing the less popular, or maybe even, less well known attractions. After a bit of searching, I found something that struck a balance between going-it-alone and having some local knowledge, in the form of the I’m Free Walking Tours. Running twice-a-day on tips alone, this so called free (pay what you want) tour of Melbourne had received relatively positive reviews and covers a good amount of ground. I decided that part of my first free day will be spent on the tour, so I could scout out some locations worth seeing and get some exercise while I was at it. Intending to join the 10:30am morning tour, I had to get myself to the State Library of Victoria. As I was staying within the CBD, it was a simple tram-ride up the street, then a walk up La Trobe Street to get there. 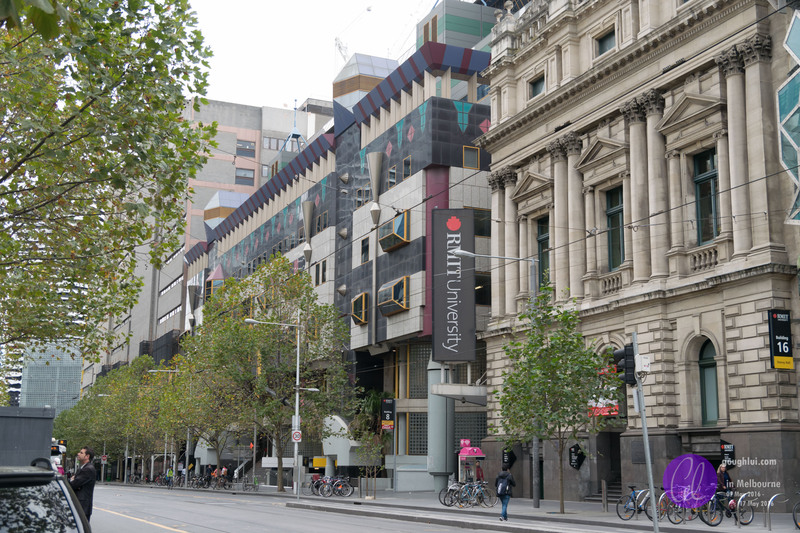 On the way, I got to see RMIT University’s campus opposite Melbourne Central station. A cluster of buildings with very different facades, it seemed somewhat reminiscent of our UTS – a cluster of disjoint buildings in the CBD. On the way, I decided to look up, where a wall was being painted. I’m sure you know by now, this is an ad for the highly hyped-up Overwatch game, but it’s interesting to appreciate the culture of Melbourne, where painting on walls seems to be the “done thing” with the right permits. Even things as temporary as ads are being painted up, which takes a bit of a human touch. Even just walking around the streets, I could see and appreciate the heritage that is often preserved, rather than destroyed. New shops being built into old buildings, preserving the look and character of the city, was one example that left a striking impression. Anyhow, it didn’t take long for me to get to the statue of Sir Redmond Barry in front of the State Library. I arrived so early that the library wasn’t open yet, and school-children were clustering around the entrance along with the others waiting to get in. The Economist was also serving free breakfast, which kind of ruins the shot, as does the broken lamp on the left side. I wonder what happened there? I ultimately didn’t have the time to go into the library, although I’ve heard its interior is quite grandiose. They don’t seem to like you taking bags in, however. A little before 10:30am, the green shirt appears in the distance. I walk up to him, and as from the website, it is Matt in the flesh. We have a quick chat, amongst many tourists and locals dropping in on the tour, and he seems to be a top bloke. Before we even start the tour, we have to grab a ticket (for their own counting purposes) which I’ve souvenired. Time ticks by, and it hits 10:30am … but we’re still waiting. Eager to make sure nobody misses out, Matt keeps everyone for another few minutes just in case. As usual, the best things are saved till last, as is the payment of “whatever you feel it was worth”. I suppose that’s one way to make sure your clientele don’t wander off halfway. We had a good crowd, probably somewhere from 20-30 which made good photography somewhat difficult as someone was always going to beat you to the punch and jump in front of you, but I suppose it doesn’t hurt to try. The tour involves a moderate amount of walking, and the pace is fairly accommodating. There are some gradients in some cases, but nothing too harsh. Matt was highly knowledgeable with many history factoids along the way. Even the hook turn got a mention in the tour, which was quite surprising. Not being a Melbournite, I was fascinated by this sign which, while containing no words whatsoever, clearly signified the way to Chinatown. The path from the library took us past Old Melbourne Gaol, where we were told part of the story of Ned Kelly while standing in the courtyard. Unfortunately, as the city has “grown” around it, the skyscrapers in the background really made it look out of place. We were also introduced to the eight-hour day monument, commemorating the eight-hour work day movement for 8 hours work, rest and recreation. This monument has a golden globe above the numbers, 888 on the top of the spire. Just across the road, we witness some painting, but not of the artistic sort. This piece of graffiti seems more politically motivated, and it seems that people around Melbourne do have a habit of mixing politics with paint as well. Some of the painting does get to a colossal scale. This one, on the side of a development is several stories tall and had to require a lot of work just to make it happen. The truly artistic stuff, I really don’t mind and can easily appreciate, but then the “taggers” come along to stamp their name over it, and it quickly gets ruined. It’s just sad. Throughout the tour, comparisons between Sydney and Melbourne get drawn, and boasts of being the biggest, best, largest, first in the southern hemisphere are made. Of course, I wasn’t too interested in the history or the boastfulness, rather more appreciating the sights. Even down in Melbourne, terraced houses exist in numerous places, well preserved. The walk continues along into Carlton Gardens. Melbourne ranks quite well amongst worldwide cities for liveability, and some of the key reasons include the inclusion of green-spaces. Lots of trees, and space for people to enjoy are a stark contrast to the newer high-density living arrangements now becoming popular. There was one interesting story about the bands on the trees – apparently, they are required to keep the possums from damaging the trees, by preventing them from climbing up the tree in the first place. Rather interesting, although somewhat unsightly solution needed to protect the non-native vegetation. Continuing through the park, we pass the fountain in front of the Royal Exhibition Building, to meet another fountain in the Parliament Gardens. … and head straight for the Parliament of Victoria. While walking towards Chinatown, a few things caught my eye. For one, there are safe taxi ranks at several places within the CBD for people to catch taxis late at night. Also, there are placards for Invisible Cities story sites, which seems to be an initiative to document some history about certain locations to be accessible through a mobile app, done by the City of Melbourne. I think these sorts of programs are quite interesting, and if I had the time, maybe I would have listened to some of the stories. The next stop was Chinatown, passing via Her Majesty’s Theatre. I couldn’t get any good shots owing to the traffic which was unrelenting, and the people. I actually got spotted by one of my fellow “conference” attendees, so we ended up having a chat as well. Everything seems to be just that little more stylish in Melbourne, so even their parking bollards have their own logo moulded into them, and the tiling is patterned. They even do signage well, as they have signs which point out which direction and how far to various attractions and cultural precincts. I think the council definitely set-up well for tourism. At this point, we’ve arrived at the half-way point of the tour, at a Queen Victoria Squarae where everyone has a short break for pit stop. Even the colours and architecture looked rather trendy, and I suppose it would, given the fact it’s in the CBD. The track from the morning’s adventure, from the hotel and including the walk looked like this. The walking tour continues into the afternoon with lots more sights to see, so follow along with the next part for more I’m Free tour action, and the overall verdict. We had similar bands around the trees at our University Campus. It wasn’t to protect the trees (as they are native), but was there to prevent Possums using the trees to get into nearby buildings! They removed the bands after a while, perhaps because they created a space for dampness to cause potential issues for the trees and maybe they weren’t effective. Those bands look different so perhaps they don’t trap any moisture.